Australia has received Volvo's first diesel-electric hybrid bus in the Asia Pacific region as a possible replacement for Perth’s existing CAT buses. The Western Australian Government announced yesterday it will begin a year-long trial of the Volvo B5RH hybrid bus on Perth CAT routes in March. WA Transport Minister Troy Buswell says the environmentally-friendly hybrid was developed for Transperth, which is run by the Public Transport Authority of Western Australia (PTA), following a visit to the Volvo factory in Sweden. "I’ve been keen to see one of these buses on our roads since I was in Sweden," Buswell says. Transperth will be running the hybrid on the Perth CAT routes and evaluating it against Volvo diesels and Mercedes CNG (compressed natural gas) buses. replace the current CAT fleet. officially launched yesterday at the Volvo dealership, Truck Centre WA, in Guildford, Perth. 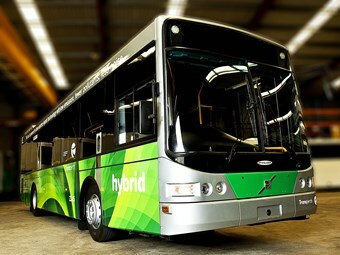 Volvo Bus Australia General Manager David Mead says the hybrid is first of its kind in the Asia Pacific region. "As the technology continues to develop and we have the opportunity to test the suitability of our technology in new markets like Australia, we expect demand to keep growing worldwide," Mead says. was assembled with a locally designed and built Volgren body following the same chassis and body approach of Volvo’s city chassis, the Volvo B7RLE. According to Mead, the fully-integrated parallel hybrid system used in the Volvo B5RH allows the vehicle to operate on either electric only, diesel only or a combination of both depending on conditions and energy requirements. The Volvo hybrid chassis is also powered by an environmentally friendly EEV 5 litre diesel engine which generates 215hp. This is complimented by an electric motor capable of producing 120kW (160hp). ideal for the hybrid technology. "The CAT service will give us the perfect opportunity to test the suitability of this unit for Australian conditions," he says. "It will allow us to directly compare the unit to the proven Volvo B7RLE units already operating in Perth."